I've already blogged fairly extensively regarding the so-called “Benmurgi Motions” (ok, apparently it's just me referring to these motions as such...I guess I'm not much of a trend-setter), so I'll leave motions G10-c14 through c23 alone. Check out my earlier blog, "Local EDA Autonomy Under Fire at Green Party BGM: Reviewing the "Benmurgi" Motions Pertaining to Proposed New EDA Responsibilities" for reasons why I'll be voting RED to all of those motions. There are a few other motions of interest under this sub-heading, however; both pertain to the Revenue Sharing Agreement. G10-d01, Change in Revenue Sharing Agreement – GREEN. Right now, the per vote subsidy our Party receives through Elections Canada legislation is split equally three ways: between the Central Party, EDA's and something called “Provincial Organizations”. If you're not familiar with what a Provincial Organization is, don't feel bad, unless you live in B.C. That's because the Party currently has no Provincial Organizations in place except for in British Columbia. We have other “provincial associations”, such as the recently created Quebec Wing (kudos to all involved with that, by the way), but those associations don't receive revenue from the RSA. So what happens to the almost entire 1/3 of the revenue then? Currently, it's being held on to by the Central Party as there isn't anyone to disburse it to. This motion seeks to simplify matters by calling for a change to the Revenue Sharing Agreement which would see the per vote subsidy split equally between the Central Party and EDA's, period. The affect will be to put more money into the hands of local organizations to assist them in building stronger associations and being better prepared when an election happens. Since I'm an advocate of putting all of our eggs into the SGI basket as a short-term strategy, and I'm an advocate of over time increasing the health and strength of our EDA's, this motion makes sense. In contrast, G10-d14, Improving the GPC Revenue Sharing Agreement – RED – creates a convoluted formula which specifies not only where revenue can go, but how it should be spent. The motion itself isn't bad, but in contrast to the more easily understood G10-d01, this motion is difficult and provides for a smaller portion of revenues being made available to EDA's. There are 7 motions under this heading, all of which would change our Federal Council to one degree or another. Before beginning, let me say this about the structure of our Federal Council. I believe that our governing body is just too big to maintain much flexibility. In fact, decision making itself has always been a challenge. That's not necessarily a knock on our elected Federal Councillors (although I really would like to see a few more take-charge Councillors in place of the “defer for more study” types Council seems to attract). Remember, most of Council's business is conducted over the telephone one Sunday night a month. Their agendas are huge and impressive. When I see the work which actually does get accomplished, I am in awe of Council, because it's clear to me that despite their less than ideal circumstances, they're trying to make things work. It also makes me realize that I couldn't do their job. So I'll just remain critical from the sidelines, although sometimes I will also cheerlead. But sometimes things get bogged down. Clearly, in my opinion, change is needed. Maybe a task-force should study a better governance structure and report back at the next BGM. I'm serious about that because, with one small exception, I'll be voting RED for all of the motions in this subheading, because I don't believe that the changes here being proposed are going to address the substantive issues with Federal Council. The only motion that I'm going to support is G10-c25, Francophone Co-chair – GREEN. I believe it's time that we started taking both of our official languages a little more seriously around here. This motion will go a ways to ensure that outcome. G10-c13, Delegate Proxy Voting By-law – GREEN, is clearly the outstanding contentious motion in this field of 8 motions, and the one which, if implemented, would have the biggest impact on our Party. Right now, our Constitution contemplates a proxy voting system for General Meetings, but we don't have a by-law which tells us how to do it (sort of like Special General Meetings, except the Constitution actually provides more clarity for the proxy issue, as it specifically calls for a by-law prior to implementation). I have to tell you, I've always been very uncomfortable with the notion that whoever can afford to come to a Biennial General Meeting gets to decide the outcomes of numerous constitutional and policy matters. While I understand that there is an opportunity for influence through an online voting process, the truth is that the really gritty matters are likely going to be workshopped, so the BGM is where all of the action is. I couldn't go to Pictou last year; I couldn't take the time off of work, nor frankly could I afford the money to get there and stay there. I voted online, but my voice on the weighty matters was effectively shut out. I was at least looking forward to watching the debates through the live-streaming from the general meeting...but alas, that's another matter. There are some options available to us as a Party. Other parties allow EDA's to appoint delegates and subsidize their trips to a general meeting. Some parties are moving towards virtual meetings, which eliminate the need for national travel altogether. I think that the Green Party should be investigating those options a little more seriously. In the meantime, though, why not proxies? If I can't make the general meeting, I can at least give my vote to a trusted individual whom I have confidence will cast a ballot in keeping with my wishes. That way, I'm given a voice on matters which are of interest to me. Think of this year's BGM: a handful of members are going to decide on how we elect a leader, and ultimately whether or not we have a leadership contest this year. These are huge decisions. Maybe it will come to pass that those at the BGM won't have to make those decisions at all, because the membership might have either voted GREEN or RED to those motions before the BGM. I just don't think that's going to happen, though, so a handful of Members who can afford to get to Toronto or who by happenstance already live close to there...they'll be the ones deciding. Here in Sudbury, only a very small portion of our membership is going to be able to pay the BGM fee and make the trip. A number of our truly engaged members are going to be shut out from having any further say as to what goes on in their Party. To me, that doesn't seem right. So I'll be supporting the proxy motion. A number of motions under this subheading seek to create a process for online policy ratification between General Meetings. Right now, we have an opportunity to develop a “Living Policy” document/process, so that we don't have to wait for two years between General Meetings for new policies to come forward and be adopted by the of Membership of the Party. I'm opposed to creating an online policy process, because many of our members are not online. And many of the members who are online are not engaged in wikis or other web 2.0 tools for the purposes of communication and sharing. Simply put, if we move to a policy process which relies on online voting, particularly a process which doesn't notify each and every Party member, we would be creating an opportunity whereby a significant number of members would be disengaged from the policy development process. Member engagement is very important, and it's true that relatively speaking, very few members are currently engaged in the policy development process at all. However, there at least now currently exists the opportunity for them to do so, and without having to figure out how to interact with others online through the use of internet tools. It's one thing to cast a vote for something online; it's another to have a respectful and meaningful discussion using wikis. Heck, using email for a respectful and meaningful discussion is often a challenge for some of our members. If you through the bloggers in there, who only know how to slag one another, well, wouldn't that be a recipe for disaster? Seriously though, let's stick to the process we have. I'll be voting RED to G10-d04, Living Policy Wiki, and G10-d06, A Continuous Policy Development Process, and G10-d08 (also) A Continuing Policy Development Process. You know, I've always considered myself to be a bit of a policy wonk, but here I am, near the end of the Green Party's online voting time, and I've barely mentioned policy at all. Maybe that's because this year's crop of policy motions seem to be, generally speaking, a lot more carefully thought out than those offered in 2008/09. I'm going to be voting GREEN on most of the motions on offer, and YELLOW on a few. Very few motions are going to be RED for me. Let's look at those which are. G10-p11, Reducing Carbon Emissions – RED. This motion will take our existing policy of a revenue neutral carbon tax and turn it into some sort of different beast. Rather than government holding on to the money raised through a carbon tax for whatever purposes it sees fit (including providing a subsidy for those who may be hit harder by a carbon tax, such as the poor or rural Canadians), this motion will provide an equal dividend back into the pockets of Canadians. So, you pay the carbon tax, you get a cheque back from the government as compensation. Sounds nice. But what it doesn't do is build the sort of Canada which I for one think we need to start building. I just think that we can be doing more for the greater good rather than catering to individuals by sending them a cheque in the mail. Let's use this revenue to benefit society. Let's not treat it as a bribe to voters who might be unimpressed with program. G10-p25, Wind Turbine Health Studies – RED. Look, are we for renewable energy sources such as wind power or not? This motions seeks to muddy the waters by calling for a study to be undertaken by Health Canada which looks into something known as “Wind Turbine Syndrome”, which is apparently a health risk to people living near turbines. Wind Turbine Syndrome makes for a good coffee table book, but it has few supporters in the realm of real science. Certainly mention of Wind Turbine Syndrome has made little impact in the world of peer reviewed scientific literature. WTS, though, like a loon a norther lake at dusk, the call of the NIMBY. Only it's a lot more annoying than said loon. What this motion will do is to put a moratorium on wind projects until such a study can be completed. It sends the wrong message to Canadians: if the Green Party is concerned about Wind Power, well, what do they stand for? For a whole host of reasons, I'll be voting RED for this one. G10-p12, Senate Reform and G10-p13, Aboriginal Representation in the Senate – RED. I'll be voting against these motions because in my heart of hearts, I don't believe we should have a senate. Therefore, I'm not going to waste my time arguing for its reform. A better position for the Party to adopt, in my opinion, is the abolition of the senate altogether. I know that I'm probably in the minority in our Party on this one, but that's the way I feel: the only thing I want to make it work better is to have it not be there to work at all. I'll be voting RED to all of the motions in this section, except for G10-p15, Intergovernmental Relations Committee – GREEN. 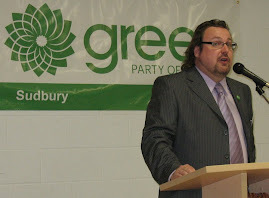 Mostly, I'm concerned about the perception of creeping federal influence/interference into provincial jurisdictions, and the potential need for Constitutional amendments (I'm one of those Greens who is very reluctant to talk about opening up our Constitution – not because I don't think we need to make some changes, but because I fear that we'll make too many). OK, that's all I've got to say about that.